A ceremony in response to the World Meteorological Day 2019 was held in the northern port city of Hai Phong on March 23, calling for actions to protect human lives and assets in the context of increasing extreme weather phenomena. 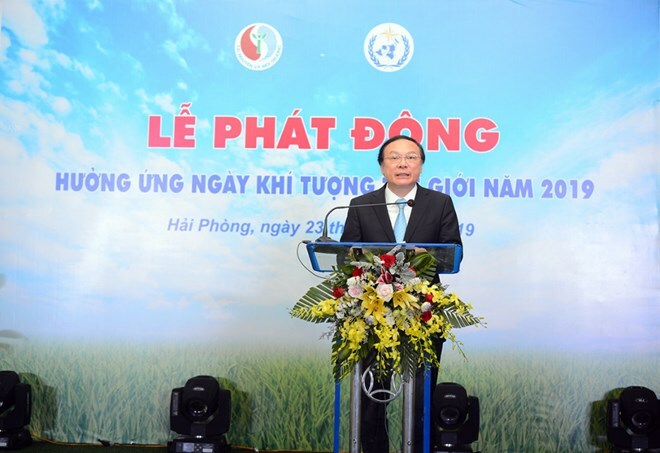 At the event, Deputy Minister of Natural Resources and Environment Le Cong Thanh said that this year’s event, themed “Celebrating the Sun, Earth and Weather”, highlights the irreplaceable role of the meteorological agencies in observing the solar system and providing weather forecast as well as information on climate change. Thanh urged competent organisations to join hands in weather forecasting work to prevent and mitigate damage caused by natural disasters. A discussion on the theme of “Sun, Earth and Weather- Our actions” was held in the framework of the ceremony, with a view to affirming the significance of the meteorological activities in the socio-economic development while pointing out challenges and orientation for the sector. Also on the occasion, a ceremony was held to recognise Phu Lien meteorological station as a centennial observing station in the world. The station was set up on September 16, 1902. Last year, the World Meteorological Organisation (WMO) listed Phu Lien meterological station among the world’s centennial observatory stations as it fit a number of criteria like at least 100 years old, providing continuous data for 100 years or more and operation in line with the WMO’s standards, among others.